Does Thalia's Lieutenant trigger on Human flips? Thanks for the suggestions moldycrow83 . 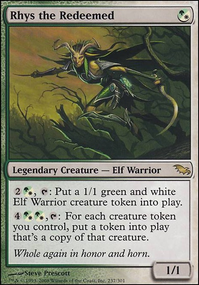 Bitterblossom is not in my budget range and shares a dowside with the Westvale Cult Leader: It only generates one token per turn which is too slow. Ophiomancer and Skirsdag High Priest are already included because they provide excellent defense. I totally like your suggestions of all the other cards. My commanders are quite mana intensive and Carnival of Souls and Black Market look like excellent inclusions! Let's get back to your deck and see if we can find some nice inclusions for it. Firstly, I like the list. I love building tribal decks, but I've never done Humans before - so good on ya! Okay here's a list of 23 cards I would take out to make your deck legal, followed by the reasoning behind why I think you should take them out. 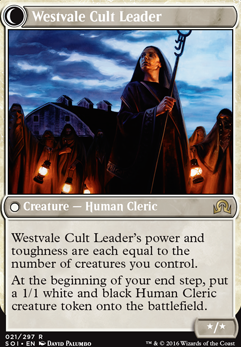 I will start by saying Westvale Cult Leader Flip isn't a real card; it's the flip side of Hanweir Militia Captain, but it seems TO won't let you tag the Captain. Dictate of Heliod, Glorious Anthem, Hope Against Hope, and Door of Destinies: I took these out because you already play so many anthem givers on your creatures; these felt like bad redundancy. Mirari's Wake, True Conviction, Heirloom Blade, Swiftfoot Boots, and Sundering Growth: Also bad redundancy. The wake felt like a bad Zendikar Resurgent. Conviction felt like an Archetype of Courage that can't attack. Boots is a poor man's Lightning Greaves, and you def. do not need both. I'd rather have Descendants' Path than Heirloom Blade. 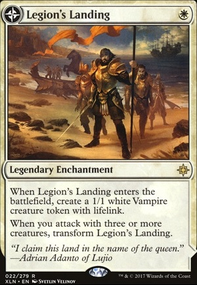 Lastly, Sundering Growth is a worse version of Austere Command. 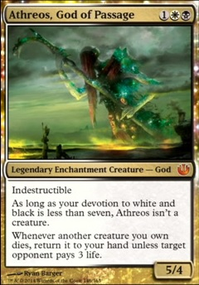 Bow of Nylea, Congregation at Dawn, Collective Effort, and Open the Armory: All these cards just seem like odd fits to me. It's not that they aren't good, but Congregation and Open specifically seem really narrow. Bow seems to care about things you don't care about, and same story with Collective Effort there. For those reasons, I'd take out these four. Fumigate, Hour of Revelation, and Wrath of God: NOPE NOPE NOT EVEN ONCE. You have plenty of Oblivion Ring effects on your creatures, AND you have Path, AND you have Swords. You do not need sweepers, your opponents do. 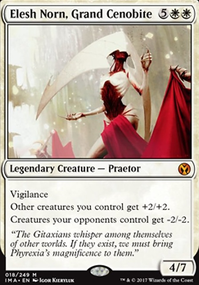 Overwhelming Stampede, Avacyn's Pilgrim, Second Harvest, and Thalia's Lancers: These seem to not be needed. Bad redundancy in Overwhelming Stampede, but it's also a spell (as opposed to Beastmaster Ascension, which is a permanent), so it leaves you open to countermagic. 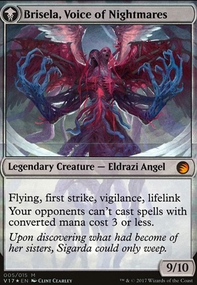 Avacyn's Pilgrim seems meh when you have ramp spells. Lastly, Second Harvest and Thalia's Lancers seem narrow. I see you make tokens, which is what Anointed Procession is for, and Thalia's Lancers can get you legends, sure, but your legends are necessarily "silver bullets," if you will. Herald of War, Selesnya Signet, and Cryptolith Rite: WOW These were hard cuts. I like Herald, but not as much as I like your other angels. The signet is okay I guess, but, considering you are a green deck, I'm not sure how much you need a target for your opponent's Nature's Claim. My last cut was Cryptolith Rite, and I'm not even sure that's correct. I had a hard time cutting your last card. I think the card is awesome, but couldn't find another spot for it, and I didn't want to cut a land (down to 34 lands) to make room, considering your top end is.. pretty top ended. OKAY! I think that's it. I hope you at least consider these changes. Everyone plays different, so these are the cuts I would make based on how I play magic. Hope this helps !! 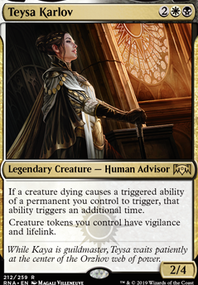 Something like that, it would be cleric heavy soul sisters, but lifegain and tokens too. The front/back of Hanweir Militia Captain // Westvale Cult Leader Flip are coded backwards, so the Captain doesn't have a "Flip" superscripted hyperlink, and the Cult Leader does. Almost forgot- Foul-Tongue Shriek is exceptional if the game goes too long. Hanweir Militia Captain flips into Westvale Cult Leader Flip btw...idk why there isn't a flip option on that. I forgot to tell you Westvale Cult Leader Flip would also work well with your squishy creatures. 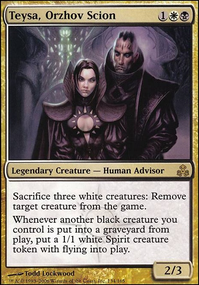 Ignore my earlier comment - I missed the fact that Sram's Expertise and Westvale Cult Leader Flip also produce tokens. I need to look more carefully at a deck before commenting. I would have gone with a few Heroic Intervention main-board to protect your swarm of tokens for at least 1 turn at a critical stage in the game. With the amount of in-built mana ramp that you have, these could even replace a few lands. Hanweir Militia Captain Flip can easily be your finisher - maybe 3 of each creature.